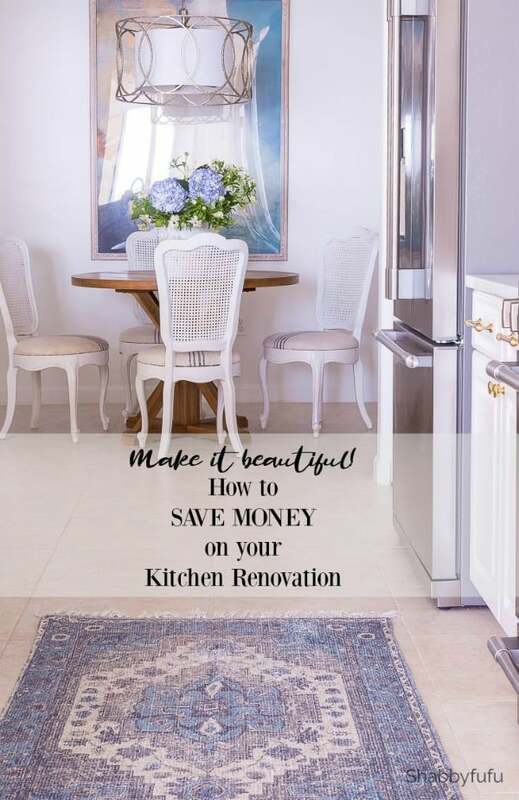 Kitchen on a budget…when you have lofty goals it’s possible to do by not ditching it all for new! Beach house coastal kitchen reveal day today, as I just realized I never shared the completed kitchen here! Slacker…as it’s been finished for over a year now. I want to share some PROOF of how you can save some money by repurposing some things and keeping other things in tact. By the way…a coastal home doesn’t have to look all beachy! You can live anywhere and have a SUBTLE beach vibe and you can live right on the beach and not have it look all Margaritaville. Agree? Sorry for the glare and the photos taken at night, but hopefully you’ll be able to “catch my drift” (bad coastal joke;-). Here is the beautiful framed print in the breakfast room…I just LOVE this piece! Although I have a few beach oriented items, I feel that by the color choices made it’s a coastal catch;-). 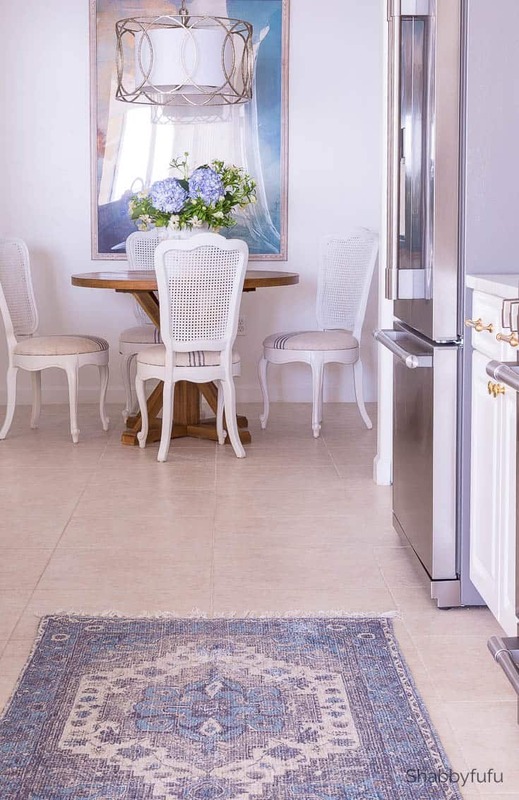 Our beach home serves as a getaway for us from the hectic lifestyle and pace of Miami. Because it’s our second home, budget when making changes is always a consideration. I love to repurpose…which we have done, and did a portion of the work ourselves. There definitely are things that you can DIY, but when working with electricity be sure to have someone work on that who is knowledgeable. There are some things about beach life that are almost a given and one of them is hard surface flooring. 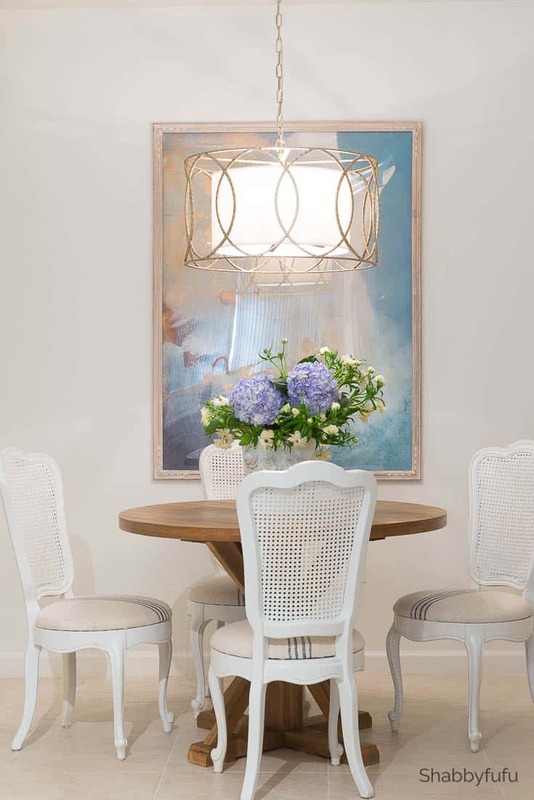 I’ve mixed in my usual French country style here in the breakfast room and yet it’s perfectly at home with the new coastal table, chandelier and contemporary artwork. I reupholstered the Craigslist French chairs with European grainsacks. An easy project and subtle coastal appeal of blue stripes. Because you are always asking for sources I’m trying to be a bit better about them. My breakfast nook table is sold out, but here is a similar table at a great price! Again, these photos were taken in the evening and the lighting isn’t the best, I apologize for that. One of the first things that we did in our kitchen on a budget upgrade is to DIY the panels under the breakfast bar. They were plain drywall before and showed footprints and were just ugly! You’d need a few carpentry skills to do this and props to my husband for this one. The stools are repurposed and we used our Wagner Sprayer to do the four of them quickly. You can see more of BOTH of those projects in THIS KITCHEN POST. We did not do a complete tear out of this kitchen and honestly it pains me sometimes to see that done. The cabinets were white to begin with because I’ve always loved a white kitchen, so we kept them! 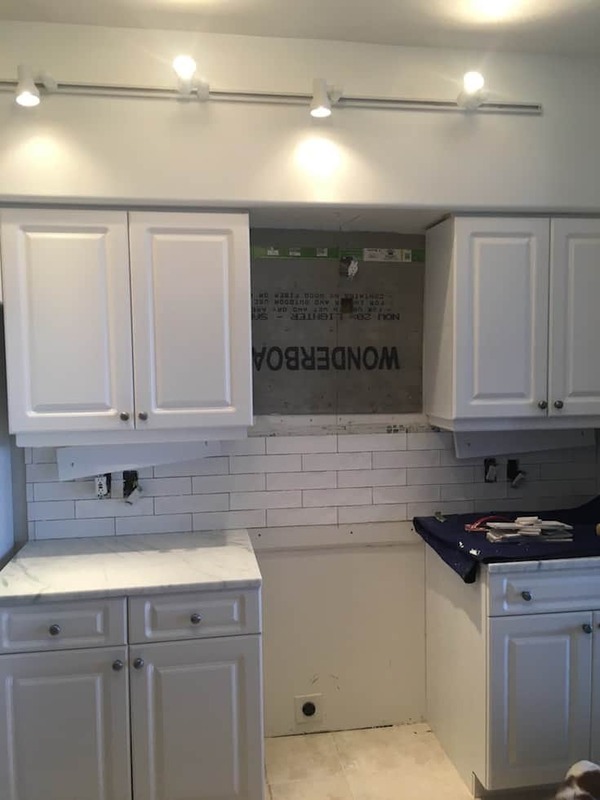 If you’re thinking of a kitchen reno and can save your cabinets by painting them…I hope you consider that. We removed one of the cabinets and the undermount microwave, moving the microwave into the pantry. We have FREE CAD plans for that and a built in coffee bar RIGHT HERE for the taking! 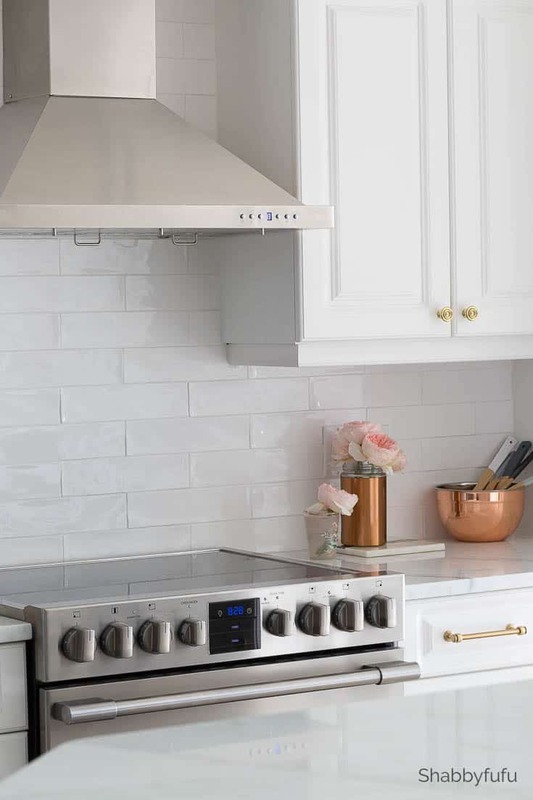 We tiled the backsplash ourselves and it’s really a simple process. The new range hood was installed over the wonderboard in the “in process photo below. Because we saved by doing projects ourselves and repurposing, we were able to purchase much needed new appliances. We went with the Frigidaire Professional Series and I LOVE these appliances! We don’t have a gas line, so the oven is electric…but they do make the same slide in range in a gas version. So far so good with no problems and appliance upgrades are what I feel you should consider spending your money on. The countertops in this home are quartzite, a natural mined material that is not quartz and more durable than marble. Here is a comparison post if you’re looking for NATURAL KITCHEN COUNTERTOPS. I will be honest that kitchen countertop material is not inexpensive, but this kitchen is on the small side and was a worthwhile investment. Other keepers were the fairly new kitchen faucet from Hansgrohe and the glorious vintage stepback cabinet next to the kitchen. If you can repurpose or keep any of your cabinets this is where you can save a ton! Paint goes a long way and new inserts can often be purchased for interior organization. Did you know that most likely if you have a faucet that you love it can be reused? We purchased a new sink here and had the plumber remove the faucet and reinstall it. You can also have faucets replated and we are considering that in an upcoming bathroom renovation. Backsplash tile installation is truly not difficult and a skill that can be learned as you go. Take a look at YouTube for some videos and just get in there and do it! Hardware can be spray painted to save you some money. We purchased new handles in this kitchen but the round gold knobs were actually salvaged from a previous kitchen remodel. Panels on existing breakfast bars or islands really kick it up a notch in builder grade kitchens. This takes a little bit of woodworking skill, and we recommend sketching out your project beforehand. Repurpose furniture such as barstools, tables and chairs with a fresh coat of paint and new fabric. Kitchen on a budget remodeling at it’s finest is a mix of old and new! Unless you are fully confident we recommend hiring an electrician for your electrical work. We not only changed out the chandelier, but installed all of the recessed lighting and the track lights. Not a job for most DIY home owners. Appliances! This is where your kitchen can not only make a statement but investing in higher end appliances and an extended warranty will save in the long run. Since the kitchen is the heart of the home, if you intend to sell down the line it’s something to consider. Countertops! Once again, something that you’ll get your best investment bang for the buck out of. Today’s choices are many, including quartz, marble and quartzite. Add some finishing touches that suit your style for your own kitchen on a budget. I love vintage and often find things like rugs, pitchers, vases, breadboards, dough bowls and more by hitting up the thrift shops often! 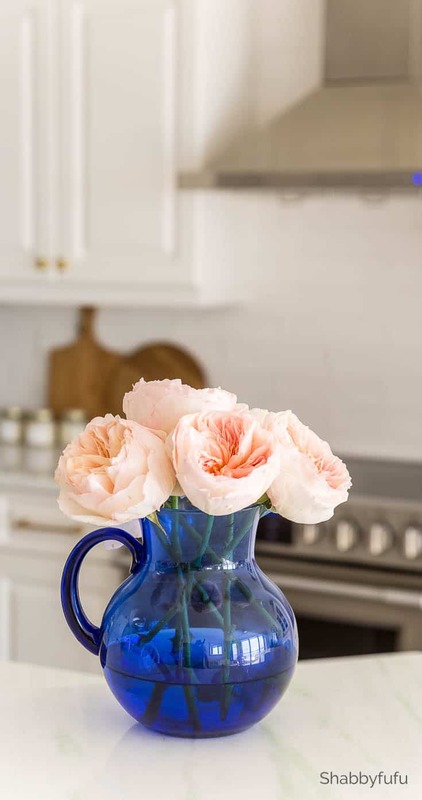 I hope that you took away some useful tips from this kitchen reveal update! Remember, it’s YOUR home and these tips can help you achieve a kitchen on a budget. It comes down to prioritizing and perhaps writing down your kitchen goals. If you have any questions, please leave them in the comments below and PIN FOR LATER! « Home Style Saturdays | $150 Pottery Barn Giveaway! Love this post! Shows what you can do with creativity and elbow grease! I totally agree not every kitchen needs to be ripped out to have a new look! Thrift stores, yard sales, estate sales are some of my favorite sources too! Hi Janet! Beautiful as always! We are getting ready to do a kitchen spruce up so we can list our house. I’m definitely painting my cabinets! We are thinking about replacing the counter tops. They were supposed to be butcher block, but they are a laminate. I’ve always disliked them. I think stone counters would really help in equity. Just a small refresh. Thanks for sharing all these tips!! Thanks Babette for stopping by and it sounds like with just a few changes you can really rework your kitchen! This is so beautiful Janet. I love your coastal vibe. And, this is a great reminder to repurpose first and shop your house before you go all crazy to buy new. I’m so glad you shared. 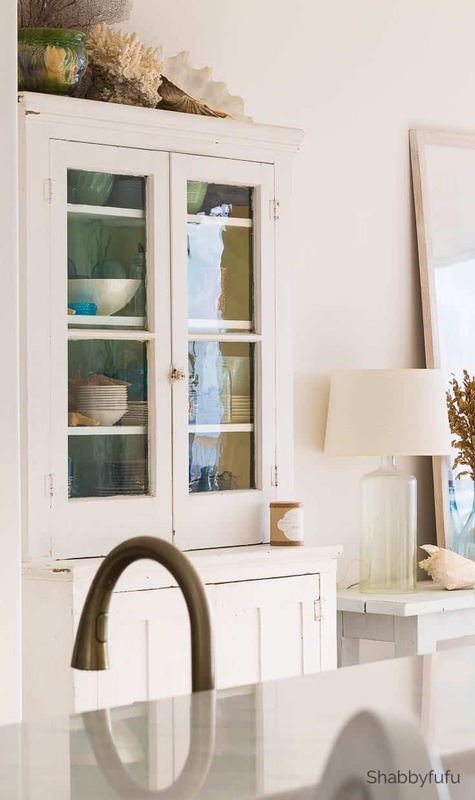 Your beach house coastal kitchen reno is gorgeous. We are actually working on our kitchen at home right now too. More of a light refresh than a reno but I agree with you that some small inexpensive changes can make a huge difference. Pinning this for future reference. It’s amazing how many beautiful kitchens I see ripped out and perhaps just in need of paint and a few changes. Thanks Patti! It’s jusr beautiful—tasteful, not cookie cutter, yet in keeping with today’s trends. Thank you so much Carol! I’m not a trend follower at all…in case you haven’t noticed, LOL. Have a wonderful week…really appreciate you stopping by. Janet, your kitchen is lovely. We will be redoing our kitchen soon as well. There was a leak under the dishwasher that damaged not just the flooring, but also the underflooring, so the base cabinets have to be removed anyway. As I searched Craig’s list for a vintage farm sink, I stumbled upon not just a double-drainboard sink, but it had a set of Montgomery Ward, 50s metal cabinets as well, bonus, the cabinets are pink! I will have to give them a fresh coat of paint, but they are staying pink. Combining them with my collection of pink depression glass, and pink Pyrex will finish the deal. That sounds like a match made in heaven for your home…perfect! Your kitchen turned out great, Janet. I really like the backsplash and counters. Thank you so much Stacey….we are happy with our partial remodel! 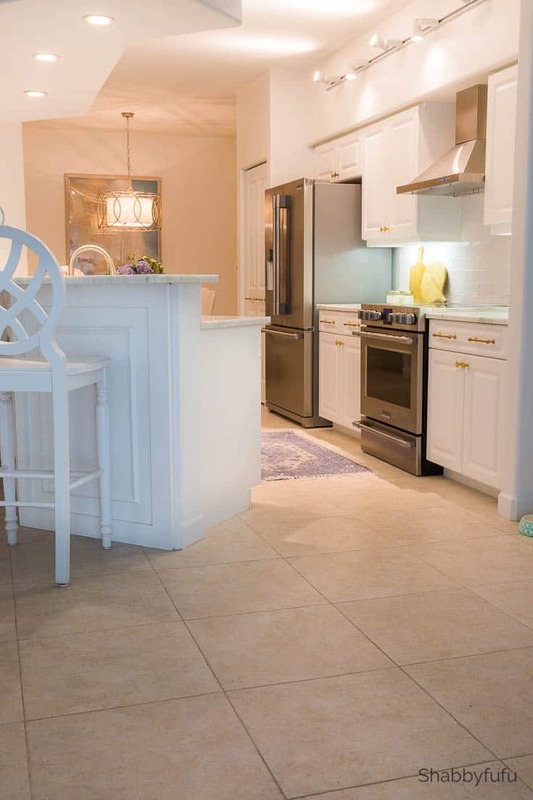 Love how your kitchen turned out here at your beach house, Janet!!! It’s so pretty and airy ~ and the whole remodel is just beautiful. <3 Enjoy it for many years to come!!! Love this light fixture! Where did you find it? Beautiful makeover. I too love the chandelier. Could you please provide a link? Thanks so much. The kitchen is beautiful!